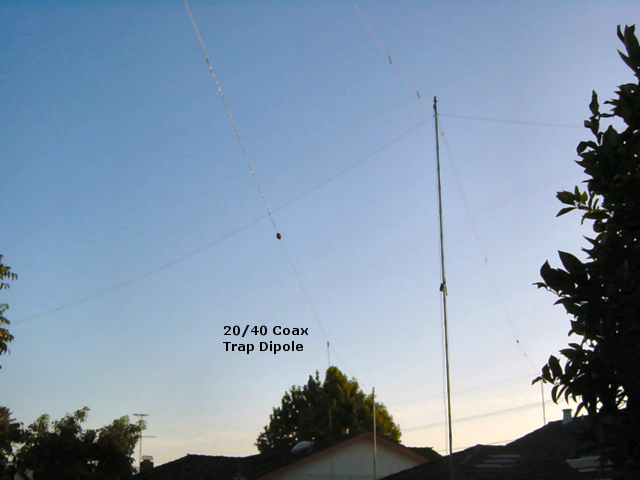 Ham Radio 20 / 40 Meter Short Coax Trap Dipole Antenna | The Wonderful World of Microcontroller! The Experiment: In this experiment were going make a Ham Radio 20 / 40 meter short Coax Trap dipole antenna. 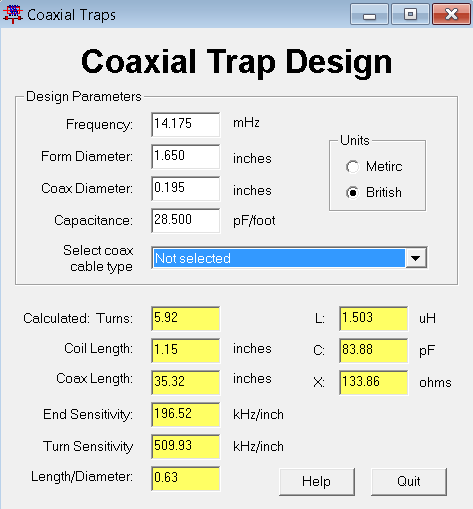 Will use the Coax Trap Design calculator software to design the 20 meter Coax Trap (See Reference Links). Design the 20 meter Trap using the Coax Trap Calculator. Step 1. Cut two 3.25″ coil form off the 1.25 PVC pipe (Coil Lenght +2″ = 3.15″ so 3.25″. Step 2. scribe a reference a line across the center length of both PVC forms. Step 3. On the reference line Drill a 13/64″ hole 1″ in from one end of both coil forms. Step 4. On the reference line Drill a 5/32″ hole 3/8″ in from both ends of both coil forms. Step 5. Cut two 40″ RG58U coax section (Coax Length +4″=39.32 so 40″. Step 6. Strip 2.33″ of outer insulation off both coax sections(40-(35.32+.02) =4.66/2=2.33). Note: Be-careful not to cut the calculated Coax Length to short. Step 7. Make a small opening in the coax brad and pull through the center conductor. Step 9. Wind the coax around the coil form to the other end of the outer coax insulation. Step 10. Mark that location on the coil form. Step 11. Back up half a turn and mark the edge of the outer turn on the coil form. Step 12. Measure back 1/2″ from the coax outer insulation mark and mark that location on the coil form. Step 13. Drill a 13/64″ hole as close to the edge of the second to the last turn mark. Note: See pencil marks on coil for position of outer hole. Step 15. Solder one side coax brad to other side coax center lead. Step 16. Tune Trap with GDO or Antenna Analyzer. Step 2. Tune the 20 meter antenna before installing the 40 meter section. Step 3. Install and tune the 40 meter section. The Coax Length in the Coax Trap Design software is the most important measurement, that section of intact coax determines the Trap center frequency. 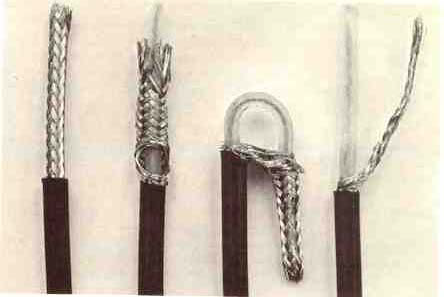 The additional striped coax length on each side of the Coax Length is used for the input/output/cross connections. There is just no way to get the exact Coax Length so the Coax Trap will have to be tuned. So it is better to have the Coax Length a little longer rather then shorter, you can bring the center frequency of a longer trap down by increasing the spacing between the coils. You can’t bring the frequency of a short trap up. When winding the trap, I did not pay to much attention to the Calculated Turns inserted 3/8 of an inch into the first 13/16″ hole then wound the coax around the coil form then marked the spot of the other end of the coax outer insulation on the coil form, then pulled back half turn and mark the end of the last turn on the coil form, then measured back 1/2″ from coax end mark and drilled 13/16″ end hole as close as possible to last turn mark, the rewound coil and inserted the final end into the 13/16″ hole. If all went well you should see about a 1/4″ of coax outer insulation inside the coil form. 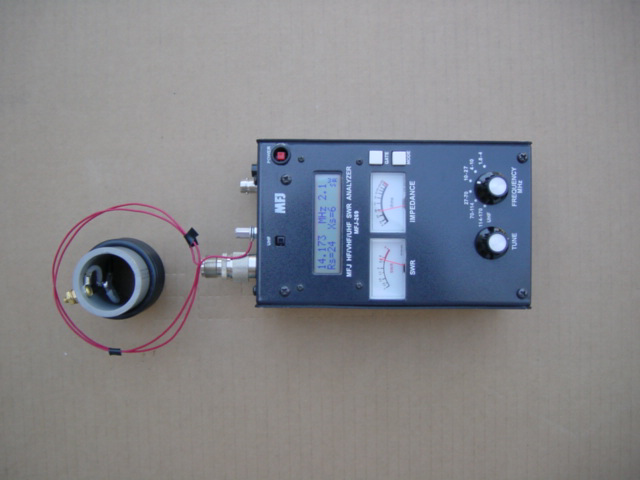 After winding and testing the 20 meter Coax Trap with the MFJ 269 Antenna Analyzer. The prototype 20m Coax Trap was not even close to the 14.175 designed center frequency. It ended up at 13.990 this tells me that the coax is to long. I was able to tune the Trap to the designed center frequency by moving the outer turn apart. Observation: I read on the internet that it would be best to tune the trap below the low end of the band, So I tune both trap to 13.999, could not get 1.0 swr on 20m, re-tuned the trap to 14.175, got 1.0 swr at 50 ohms on 20m and 2.7 swr at 50ohms on 40m. I also revered the trap and feed it from the other opposite side no notable difference. The 20/40 meter Coax Trap dipole antenna seems to work pretty good on 20 meters, on 40 meter had to use the tuner. It received well on both bands. I have since fine tune the 20 / 40 meter trap dipole and this is a really nice antenna for limited space. RG stands for “Radio Guide” and is a military term. The 58 class has an outer diameter of 0.195 inches, 50 to 53.5 ohms impedance, and can handle up to 500 watts of HF (High Frequency) power. RG58/U has a solid center conductor of 20 AWG bare copper. Its capacitance is 28.5 pF per foot. RG58A/U has a center conductor of 20 AWG stranded tinned copper. Its capacitance is 30.8 pF per foot. RG58C/U has a center conductor of 20 AWG stranded tinned copper. Its capacitance is 30.8 pF per foot. It’s outer jacket is a different material than RG58A/U. 7.025Mhz would be 23.11 feet long.